Vittorio Grigòlo has had a meteoric rise in the concert and operatic world, but has also scored great success in the crossover realm. 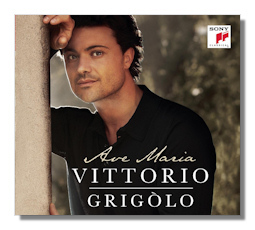 This new disc, featuring many Ave Marias and Marian or Marian-related vocal works, would certainly seem to be geared at the latter group, as arrangements are typically Romanticized and sentimentalized, pretty much fulfilling the style of what Grigòlo himself calls "popera". If this disc's offerings were likened to a meal, I suppose you might conclude the chef had a bit of a heavy hand with sugar and spice, but tasty sugar and spice. Try the Cesar Franck Panis Angelicus or the Schubert Ave Maria: rarely have these hymns sounded quite like something in the broadly appealing but somewhat homogenized style of André Rieu. Mind you, this is not a criticism of either Grigòlo or Rieu, as both are quite talented and highly successful in whatever kind of music they choose to perform. But I would expect that many Classical purists would likely scoff at this latest disc by Grigòlo, even as they would have to concede the performances are excellent, just the kind that will almost certainly cause this CD to climb high on the charts. Actually, there's much here to appeal to the singer's many fans, even those among them who call themselves serious listeners. The opening track features a splendid version of Catena's Ave Maria, mawkish though one could claim the music is. Capocci's Dolce cuor del mio Gesù is beautifully sung by Grigòlo as well, and here he is joined by the excellent Vatican City-based boys' choir I Pueri Cantores della Cappella Musicale Pontificia detta Sistina, who perform in several numbers, including the ensuing work, Bartolucci's Ave Maria. This latter piece is easily among the most appealing items on this disc, as first Grigòlo sings the enchanting melody with such passion and warmth, and then is followed by the angelic sounds of the boys' choir intoning the lovely theme. The operatic side of Grigòlo emerges appropriately and convincingly in Verdi's Ingemisco from his Requiem. Caccini's Ave Maria is another great success – all the Ave Marias here are splendidly sung in fact, though their arrangements sometimes make them sound like sacred music lite. The closing number, O Holy Night, features the popular young singer Jackie Evancho in a duet with Grigòlo. Both sing splendidly, though I believe Grigòlo holds back a bit so as not to overpower the slighter voice of Evancho. Accompaniments are consistently excellent throughout the disc and the sound reproduction is fine, though in some numbers Grigòlo appears to be a little too close to the microphone. A fine disc then that will, I'm sure, achieve that rare combination of artistic and commercial success.